Idaho is state #7 of the 50 state postcard design challenge. I didn't know much about Idaho before illustrating this card. I learned that they have a huge agricultural industry and besides producing potatoes, they also grow onions and supply mint to a variety of businesses. They have gorgeous state parks, fossils, a rich Native American history, hot springs and lots to do for tourists. They have an animal called a fisher who strangely don't eat fish, but are related to weasels. They're pretty cute. My illustration doesn't do them justice. Next up is Utah! Are you joining along with the 50/50 state postcard challenge? Tag your posts with #5050postcards on social media. Feel free to go at your own pace. I'm playing catch up, but having fun! Week 6 was Nevada. Week 5 was Oregon. Week 4 was Washington. Week 3 was Alaska. Week 2 was Hawaii. Week 1 was California. Here we go again, number 5 in the 50/50 state postcard project is Oregon! This is a state I've visited and spent some time in. I particularly love the coast and the diverse creatures residing there. Oregon is another big wine producer (not pictured, as last week's state Washington is the second largest in the USA after California), but it does host many family run dairy farms and is home to beloved creamery Tillamook. This explains why the Oregon state beverage is milk! The state includes vast forests, coast, rivers, fauna, agriculture and industry and there was plenty to chose from to represent our 33rd state. Next up is Nevada. Last week was Washington. Week 3 was Alaska. Week 2 was Hawaii. Week 1 was California. Good morning! It's week 3 of the 50/50 State Postcard design challenge, coming in a few days late. We've got Alaska, the 49th state. A beautiful place with lots of great animals, scenery and culture, there was so much I wanted to try and fit on this card (native art! glaciers! whales!) that didn't make it. This is a very minimal interpretation of our northern-most state and I like it a lot. Last week was Hawaii. The week before was California. Happy Wednesday! It's week 2 of the 50/50 State Postcard design challenge. This week's state is Hawaii! I had a variety of ideas for this tropical paradise and settled with a few familiar elements. I also added an illustration of the islands since Hawaii is an archipelago, made up of many islands, which many of us forget. It was fun learning about the flora and fauna of Hawaii along with the volcanoes and many interesting tidbits about our most recent state. First in my weekly series of 50 State Postcards starts with of course, California! Though not the western-most state, it is where I live. We've got ocean and mountains, deserts, beautiful wildlife, parks, a robust wine and agricultural industry, volcanoes and so much more. It was tough to choose what to showcase from our wonderful state. I'm really pleased with how this first card turned out. 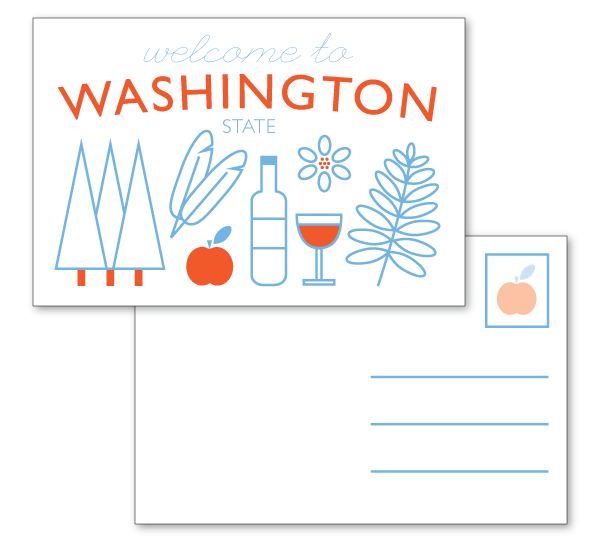 Each Wednesday will feature a new state postcard. 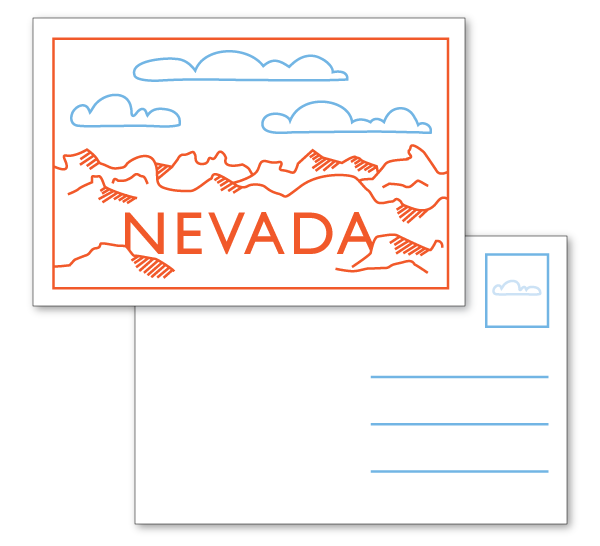 Play along and make your own state postcard with the tag #5050postcards.